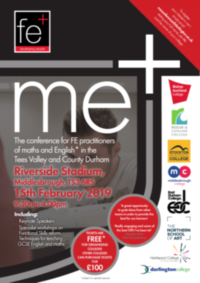 mE+ is a maths and English conference for practitioners working in further education. The day will include expert keynote speakers, workshops along with an opportunity to share best practice and network. The conference will feature workshops covering topics such as engaging the disengaged, techniques for teaching GCSE maths and English and preparing to deliver the new Functional Skills qualifications.